Right click on the C3SHost system tray icon. Click RESTORE. If there are any system error messages they will display on this popup. Could not find a base address that matches scheme http for the endpoint with binding MedataExchangeHttpBinding. Registered base address schemes are . This error typically occurs when the database being used is disabled in the SSLIP. Ensure that the database is enabled (either Control or SMS). The type initializer for 'System.ServiceModel.DiagnosticUtility' threw an exception. Close the SSLIP and C3S (if running) and re-launch the SSLIP. Verify the C3S host application is running and the SSLIP.exe.config has the appropriate URL to the service. Would you like to try connecting again? The C3S application has not been installed or is not running on the server. Localhost is not accessible from the local computer. Copy the installation file (C3SInstaller.msi) to the SSLIP folder and restart the SSLIP. The SSLIP will automatically run the install file. Check the hosts file located in C:\Windows\System32\Drivers\Etc to ensure that there aren't any incorrect entries that are re-routing localhost to another IP, such as 0.0.0.0. The C3S install is corrupted or using incorrect files. Check file versions to make sure they're the correct ones. Replace with a new install. 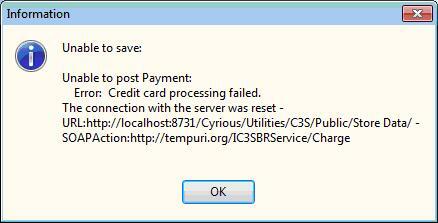 HTTP could not register URL http://+:8731/Cyrious/Utilities/C3S/Public/. On Windows Vista and later versions, HTTP web services listening at a particular HTTP address on user accounts other than the system administrator are restricted to run with Administrator privileges by default. Login as the system administrator for that machine and run the SSLIP. Type the following: netsh http add urlacl url=http://+:8731/Cyrious/Utilities/C3S/Public/ user=Everyone. Restart the SSLIP and C3S. By default, the C3S host is configured to connect to the SQL database using “Integrated Security=True” in the connection string. For most Control setups, the SSLIP is run on the same machine as the SQL Server and the logged in user has access to the database. However, in cases where SQL Server is located on a dfferent machine and the logged in user does not access privileges to SQL, C3S will fail to login. Modify the permissions to include dbadmin, sysadmin. Restart the SSLIP and log into Control. Remove the Integrated Security=True parameter from the connection string. *Note: Replace USERNAME and PASSWORD with the appropriate user name and password to access the SQL Server database. The C3SHost.exe.config file was not updated by the SSLIP. Run the SSLIP on administrator's login or Right-click the exe and Run as administrator. Check the date and time stamp on the C3SHost.exe.config file to verify it was updated after the sslip runs. or one of its dependencies. The system cannot find the file specified..
Running the SSLIP with the C3S installer MSI in the path from a UNC such as “\\CyriousServer\Cyrious$\”. The SSLIP passes the file path it is running from to the C3S installer as a parameter but the installer expects a local path to install to. Go to the actual local path where the SSLIP is located (“C:\Program Files\Cyrious\SSLIP\”) and run it. Error: Credit card processing failed. The communication between the SSLIP and C3S is being blocked. 1. Open AVG's User interface. 2. Disable “LinkScanner” and “Online Shield” components. Ensure that the status within the AVG window shows “Disabled”. sure to verify through testing that this component is not leading to your problem. AVG www.avg.com - Disable Link Scanner and Online Shield components. Kaseya www.kaseya.com - Unable to add exclusions, user must contact Kaseya technical support or uninstall Kaseya. During these steps we'll force the SSLIP to recreate the necessary connection strings for C3S. Naviagate to the C:\Program Files\Cyrious\SSLIP\ folder. If the option UpdateC3SHostConfig=0 option exists delete that option from the file and save your changes. Restart the SSLIP. During the restart of the SSLIP the connection strings are recreated each time based on the configuration within the SSLIP.